Sentinel is the second real time 3D adventure game from Detalion, following Mysterious Journey 2 (which is known as Schizm 2 in Europe). Although the user interface in Sentinel is very similar to that of Mysterious Journey 2, the story is structured differently and the game is entirely in first person. Even the cut scenes are done in first person and you never actually see your character. Sentinel takes place on Earth some 1900 years in the future. 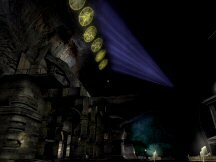 The game starts as the camera moves along the walkways of Tomb 35 in a long tracking shot, while your character, Beni, does a voice over narration about his previous experience exploring the Tastan tombs. These tombs are some 500 years old and much of Tastan culture and technology has been forgotten during this time. The introduction ends with a cut scene where Beni is coerced into exploring and bringing back something of value from the dangerous Tomb 35 by a black market trader and his henchman who are holding Beni's sister hostage. What makes Tomb 35 so dangerous is the Sentinel who guards the place. In the game, she is known as the Dormeuse. She has a reputation for being clever and ruthless. No one save the legendary Ramirez has entered Tomb 35 and returned home to tell about it. Beni meets the Dormeuse shortly after he enters Tomb 35. Throughout the game he has an ongoing discussion with her. She wants something from him, but what? If she's only a protection program, why doesn't she simply kill him? The Dormeuse appears to Beni as a sort of hologram, but her power doesn't end there. She recreates what appear to Beni to be real places. He is able to walk through these worlds and interact with them as if they were real. The Dormeuse sets up various tests for Beni - the puzzles you must solve in the game. Her purpose in doing so is unclear to Beni. Is the Dormeuse really the uploaded personality of the woman for whom the tomb was built, or merely a very clever defense program, gathering information on human behavior? Beni isn't certain. The Dormeuse seems to want him to see virtual representations of the worlds in which she (or at least the person for whom the tomb was built) lived when she was alive. But for what purpose? Why is this important to her? Most of the puzzles in Sentinel are mechanical types. Many of them involve recognizing and associating patterns, colors, sounds, or symbols. Unlike Detalion's Schizm games, there are no math puzzles involving bases other than base 10. Nor are there any conversation puzzles. Conversations are automatic and are usually initiated by the Dormeuse. There are seven "worlds" in Sentinel (eight if you count Tomb 35 itself). Clues to the puzzles in any world are all found in that particular world and not spread around in the others. So it is never necessary to search one of the other worlds for clues and return to solve the puzzle. But there may still be a lot of running around within a world to find clues. Some clues are located near puzzles, but much of the time you'll have to explore around the gameworld to find clues. Sometimes you'll have to adjust controls, then run back to see what effect that might have had. Since Sentinel uses a fully real time 3D interface, you can run around almost anywhere you want and look at things from different angles. Some of the puzzles make use of this, even require you do this, in order to find the solution to a puzzle. The Dormeuse makes sure that Beni examines her worlds carefully rather than just breezing through them. There isn't much in the way of inventory in the game. You have to collect a few objects, but they are automatically placed in inventory when you click them and automatically used when you click on the appropriate place in the gameworld at the appropriate time. You never pick up an inventory item and click it on something and you never combine inventory to create a new item. Sentinel actually takes place entirely in Tomb 35. But the seven worlds the Dormeuse creates seem like entirely separate places. The Dormeuse explains that they are only a small piece of the original worlds - places she loved in life - and she has altered them slightly for Beni's benefit (I assume by adding puzzles to them and removing or altering more practical structures, like living quarters). There are seven worlds with puzzles that may or may not be interrelated. There are no people in the Dormeuse's worlds. Beni has to solve her puzzles by himself. The Sentinel installer does a complete install to the hard drive from 2 CD's. Once installed, you can put away your CD's. You do not need a CD in the drive to start or play the game. There are no options for different install sizes and the total hard drive space needed is listed as 1.6 GB. The controls for Sentinel are very similar to those in Schizm 2. The default layout uses the WASD keys for movement, the arrow keys for looking around, and the mouse for nearly everything else. But this setup is easily changed in the game options if you prefer a different movement system, such as using the arrow keys for movement or using the mouse for everything. Sentinel is not a point-and-click game, but can be played entirely with the mouse. Using the Escape key during the game will bring up the In-Game Menu from which you can Save or Load a game, adjust the Settings, or read a Transcript of what was said during cut scenes. The spacebar can be used to "hop," but as in Mysterious Journey 2 (Schizm 2), you never have to use it unless you feel like it. Beni may be a "Tomb Raider" of sorts, but he never has to jump over lava. He uses the bridge like a normal person. The Main Menu screen you see when you first start the game allows you to Continue Game, start a New Game, Load Game, change Settings, view Credits, or Quit. The game autosaves every time you exit. Sentinel has a variety of options available through the Settings Menu. "Game" allows you to toggle subtitles and a hint feature. "Display" allows you to change your gamma setting, choose your level of details (high or low), choose your resolution (640x480, 800x600, 1024x768, 1152x864, or 1600x1200), and toggle anisotropic texture filtering on and off. "Sound" allows you to adjust the overall volume and toggle music on and off. "Controls" allows you to change the walk speed and mouse sensitivity and gives you the option of inverting the mouse. You are also able to change the default movement controls from the "Controls" menu. If the hint feature is enabled in the "Game" options, a hint will appear in yellow text at the top of the screen whenever you get near a puzzle. The hint gives you a clue about how to get started on a puzzle, and sometimes helps you identify the objects that are part of the puzzle. The In-Game Menu is accessed by using the Escape key during the game. It looks very similar to the Main Menu with options to Resume Game, Save Game, Load Game, adjust Settings, read a Transcript of what was said during cut scenes or monologues, or go to the Main Menu. The Settings Menu is exactly the same as in the Main Menu, allowing a quick way to adjust controls during the game. Sentinel is a real time 3D game. It uses a tweaked version of the Jupiter game engine, the same engine used in Detalion's previous game, Mysterious Journey 2 (Schizm 2). Like most 3D games, the graphics will look better if your computer and graphics card are capable of displaying them at maximum settings. There is plenty of surface detail and realistic texturing. I found myself admiring the different types of wood surfaces used in the Eska world. The dirtied snow in the path in Sanselard also looked quite real. Some areas have better detail than others, so I don't know if I can say that Sentinel's graphics have improved significantly over those in Mysterious Journey 2. But there is certainly a lot of interesting stuff to see. Anyone who's familiar with Mysterious Journey 2 will see some similarities in the features of the gameworlds in Sentinel. There are plenty of background animations in Sentinel. Wherever there is water, there is water movement. Objects will sway in the breeze. Wind machines will turn. In Corabanti the volcano will occasionally spit out chunks of lava as smoke rises from its cone. Lava fields move and occasionally throw up sparks. Goda has sea turtles swimming around and large sea plants undulating in the current. In Maru you can look down and see the machinery churning around. Don't miss seeing the Detalion Blimp in Maru, with its propellers turning as it floats slowly around the main installation. Glowing insects circle flowers in Tregett. Snow drifts down from the sky in Sanselard. Every world has animations unique to it. There were so many animations that it seemed strange to get to Argannas and find that the large black beasts out on the prairie never moved. Maybe it wasn't their nature, but it made me curious to get a better look at them and find out why they were standing so still. The animations of characters in cut scenes were done so as to be unique to the situation. The Dormeuse did not recycle the same movements over and over every time she spoke. During her conversations with Beni, she assumed various postures according to the tone of the conversation, sometimes crossing her arms or turning her back on him, sometimes lounging on virtual furniture or playing a few notes on a virtual piano. There were very few characters in the game. Except for the introductory and closing cut scenes, there is just Beni and the Dormeuse. I thought the voice of the Dormeuse was very well done - sometimes soft, as she "remembered" the places that meant something to her in life - sometimes mocking or bitter or angry, demanding Beni tell her what it is his people get out of robbing the tombs. I didn't think the voicing used for Beni was quite as good. Sometimes he made some comment that seemed out of place, or not spoken in a believable manner. But usually he was OK. None of the characters spoke with a noticeable accent so I assume American voice actors were used. The music that played during the game was mostly nonintrusive. Occasionally it was similar to the music in Schizm. It was generally of the same type as in Schizm - something to set the mood and not something you can hum along with. The music that played at the main menu had more of a beat than what was used during the game. The only time I really had a problem with music in the game was during a cut scene in Corabanti, when the Dormeuse was fiddling with a virtual Victrola while talking to Beni. The "music" emitted from the Victrola tended to drown out the voices. Also it didn't seem like something the Dormeuse would be likely to listen to considering how she talked about meditation and being one with the spirit of the place. The background sounds were very well done. In some locations, like Eska, I liked the background sounds so much I turned off the music so I could hear them better. One of the tweaks Detalion made to the Jupiter game engine was done so they could customize the background sounds and you can hear the result. As I moved around the piers of Eska, I could hear creaks when I got close to the ammonite spirals that were swaying in the wind. I'd start to hear the sound of the water spurting from the fountain as I approached it, then fading out as I moved away. All the while I'd hear the sound of the water lapping at the piers as well as other sounds that you might hear in such a place. The other worlds had similar sound layering, but I noticed it most in Eska because I had the music off. None encountered on the Athlon. With the P4 there was an occasional glitch where I would suddenly find myself looking straight downward. I'm not sure if I was displaced from my location, but if I was, it was only a couple of steps away. It wasn't a big deal to look back up again, but was sort of disorienting when it happened. This glitch happened at random. It didn't happen all that much, but happened often enough that I knew there was a problem. It didn't happen while I was playing Uru, but I haven't played enough real time 3D games on the P4 to know if it happens with any other 3D games. I think it's to do with the ATI X800 video card in the P4, which is a new model. It never happened on the Athlon, which has a different video card. Sentinel is very resource-intensive for an adventure game. Although the minimum specs call for a 1 GHz Pentium III, I'd recommend playing it on something much faster. Also, though the specs on the game box only call for a 3D video card with 64 MB of video RAM, the video card must also be capable of hardware T&L (transform and lighting). The box for Mysterious Journey 2 listed the T&L requirement, but for some reason the Sentinel box does not. The story of Sentinel is based on the short story "The Ichneumon and the Dormeuse" by Australian science fiction writer Terry Dowling. Gameplay is nonlinear, but you will have to solve all the puzzles eventually. I was not too happy to see so many sound-based puzzles with no alternative method to solve them. In the future, I hope Detalion includes some provision for people who have difficulty distinguishing sounds. For example, when something makes a sound when you touch it, there could be subtitles that would describe the sound. I've seen something like this in a Nancy Drew game. I'd heard that Sentinel was going to be easier than Mysterious Journey 2. I didn't find it easier, just different. There are at least two puzzles in Sentinel that I found very challenging. I still haven't figured out the first puzzle in Sanselard, not because I can't hear the sounds but because I keep losing track of where I am, lose patience, and end up looking up the answer in the walkthrough. It's the only puzzle in the game that I give up on like that. I'd recommend Sentinel to almost any adventure gamer who enjoys first person puzzle-oriented adventures, as long as their computer is up to the task. There is no dying in the game and you can't accidentally walk over the edge of a precipice. So you can work on solving the puzzles at your leisure. There are quite a few sound-based puzzles, so those who have difficulty distinguishing sounds will probably have to consult a walkthrough for those puzzles.